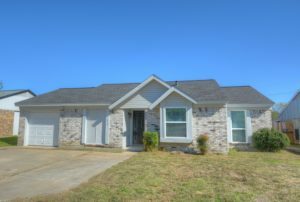 – This beautiful home has LOTS OF UPDATES including new windows & custom blinds. Kitchen showcases granite counters, tumbled travertine backsplash, under-mount sink, stainless appliances, & expanded breakfast bar open to living area. Recent roof & HVAC. New carpet in bedrooms & luxury wood-look vinyl plank flooring thru-out the rest of the house. Hall bath has beautiful subway tile surround. Both baths have a new vanity, granite countertop, under-mount sink & a full size tub. Home also features pretty 3-tone interior paint thru out, new brushed-nickel light fixtures. Spacious backyard has large patio, shade tree, storage building & new fencing across back. Conversion can be 2nd living or study. Extra parking. If buyer has local house to sell first, owner will consider trade in. "Teresa Roten is a wonderful real estate agent to deal with. She always has a cheerful smile and is definitely a knowledgeable, encouraging and level-headed person to have working with you, especially in difficult negotiation settings. Her many years of experience make her very much an asset. She gives... continued"